Stills can’t capture the beautiful parallax effects of this website we built for Casey Cooper, a mortgage banker with USA Mortgage. As with all of their lenders, Casey was given a free corporate website when hired — and as you can probably imagine, that cookie-cutter corporate template left MUCH to be desired. (It even uses Flash!) Some of the folks there have wised up and established their own web presence, and Casey asked us to do the same for him, even giving us some fellow co-workers’ sites to use as guideline examples. 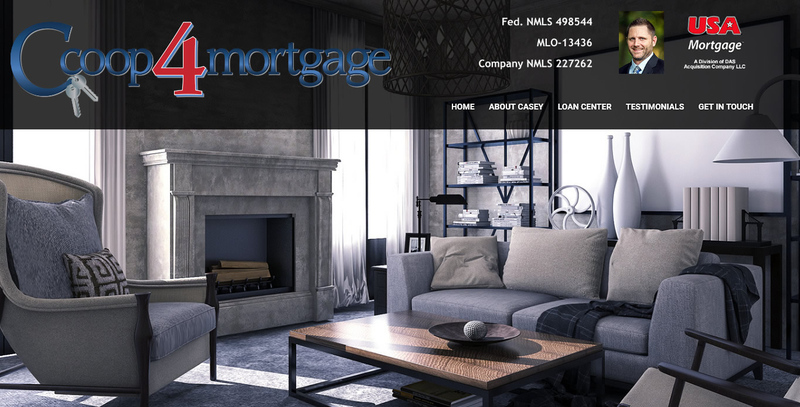 Check out the full site at: www.ccoopformortgage.com. And if you know someone who needs a loan and would like to work with an experienced lender who gets the job done right, have them call Casey. He always has your best interest!